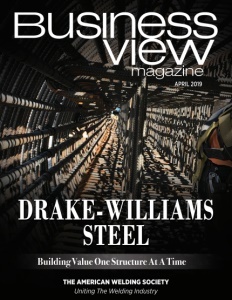 Edward Arnold Scrap Processors, Inc.
Business View Magazine interviews Edward Arnold Jr. of Edward Arnold Scrap Processors, Inc., as part of our focus on the recycling industry. The company accepts all ferrous materials such as commercial scrap metal, construction equipment, appliances, cable and wire, farm machinery, junk cars and trucks, structural beams, etc. Acceptable non-ferrous items include aluminum cans and extrusions, brass and bronze, electric motors, heater cores and radiators, scrap lead, copper wire, etc. It also accepts newspapers, books & magazines, cardboard, office paper, phone books, and plastic containers at no charge to the customer. With 25 trucks on the road, Edward Arnold Scrap Processors’ services include: dump trailers, flatbeds, van trailers, and roll-off containers from 10 to 80 yards. A roll-off is an open top dumpster characterized by a rectangular footprint, utilizing wheels to facilitate rolling the dumpster in place. The container is designed to be transported by special roll-off trucks. Roll-offs are commonly used to contain loads of construction and demolition waste. The company also provides roller bins with valves that allow customers to recover fluids that are essential to their business. Regarding those roll-offs, Arnold says that when the company first acquired them, it became a way in which to counter the negative image that some held about the scrap business. “We got them all painted, and put our name and phone number on them,” he recounts. “A lot of people in the industry just have rusty old pieces sitting outside the place that you throw scrap into.” According to Arnold, that unwarranted opinion about the scrap business also redounded to its owner: Arnold Sr. used to be considered the “junk man.” But as recycling started to become more fashionable, people’s attitudes changed, and other businesspeople began reshaping their notions about the scrap industry and its environmental benefits. “Everybody had always looked at the scrap dealer like Sanford & Son. All of a sudden, we were looked upon a little differently than before,” says Arnold. Indeed, Ed Arnold Scrap always looks for new ways to recycle and keep the environment clean. A new type of product it has begun to recycle is electronic waste, which has become a major concern to the environment. So now, it accepts all types of electronic equipment: circuit boards, televisions & monitors, computers, peripherals, etc. Arnold believes that being a family-owned business is a competitive advantage. “The scrap industry used to be made up of family businesses,” he explains. “About 15-20 years ago, there was a lot of consolidation and the family businesses sold out to bigger scrap processing operations. We’re one of the few family operations left up in Western New York. So, we treat people more like family and the way we would want to be treated. It’s that personal touch that we give to the customer.” “My father still shakes every customer’s hand that comes in here,” adds Arnold’s sister, Denise, the Assistant Secretary/Treasurer. WHO: Edward Arnold Scrap Processors, Inc.